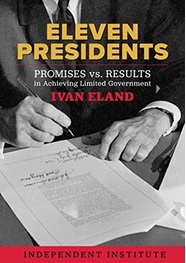 Ivan Eland is Senior Fellow and Director of the Center on Peace & Liberty at The Independent Institute. His latest book is"Eleven Presidents: Promises vs. Results in Achieving Limited Government" (2017). And he might be right. Republicans, starting with Reagan, realized that being fiscally responsible didn’t win votes (the Democrats learned this earlier, during the presidencies of Woodrow Wilson, Franklin Roosevelt, John F. Kennedy, and Lyndon Johnson by adding huge spending programs). Unfortunately, voters love government programs from which they benefit—they just don’t want to pay for them. Thus, tax cuts are popular, spending cuts not so much. Furthermore, because the ill effects of yearly budget deficits and thus the mounting national debt are economically severe but largely invisible, few people vote against politicians when these both accumulate. Finally, those hurt the most by the huge national debt—future generations who will have to repay the borrowed money plus interest while not benefiting as much from the prior spending—are weak politically because they cannot yet vote or are not even born. Yet such debt not only drags future economic growth but has slowed U.S. growth since the Great Recession. Government borrowing crowds out private borrowing. When businesses have difficulty borrowing, they put off rejuvenation or expansion, thus slowing growth rates and the enlargement of prosperity. Although the United States has the crutch of the dollar being the world’s reserve currency, essentially acting like an interest-free loan, the irresponsible growth of its national debt as a portion of GDP nevertheless eventually could still be a severe problem—like that experienced recently by Greece, Spain, Italy, and Ireland. This would be especially true if the dollar ever ceases to be the reserve currency because of relative U.S. economic decline compared to other faster growing nations. 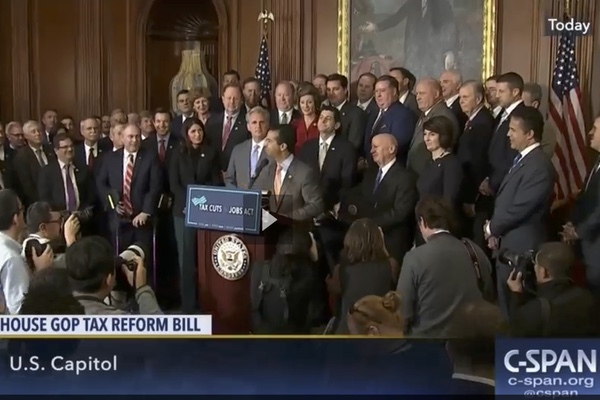 Tax cuts are not bad per se but should be delayed until federal spending has been cut significantly, budget surpluses run for a time, and the current $20 trillion national debt paid down. As I explore in my new book, Eleven Presidents: Promises vs. Results in Achieving Limited Government, better examples for Republicans to emulate would be the Warren Harding/Calvin Coolidge or Dwight Eisenhower models. Harding and Coolidge cut taxes but also slashed domestic spending to levels lower than before World War I. Eisenhower was one of only two post-Truman presidents to cut federal spending as a percentage of GDP (Bill Clinton was the only president to out-best him in this category). Ike did it by cutting defense spending, something Trump seems loathe to do, even though he has succeeded in getting allies to at least pledge more spending for their own defense, and he has complained loudly about past presidents getting us into costly unnecessary wars. Of course, the big social entitlement programs, such as Social Security and Medicare, also need to be reformed, but Republicans, despite their past and current hot air about doing so, just never seem to get it done. Trump and the Republicans are more concerned with “winning” something—anything—so they can all be re-elected in 2018 or 2020, instead of doing what’s best for the nation while putting that at risk. As Reagan and George W. Bush demonstrated, enacting massive tax cuts while federal spending continues to go north was in their self-interest in getting re-elected but harmed the country in the long term. Unfortunately, Trump seems to be even more self-interested and less civic-minded than his reckless predecessors.